In order to follow this guide you will need to download Need for Speed Underground 2. Please click the green button below. Right at the start of the game we will see a very surprising intro video with car races, crashes, skidding and tuned cars. If you want to skip it, you may simply press “Enter”. This is what we see after the intro video. Here, we need to press Enter key to access the main menu of the game. The first option, as we can see in the menu, is Free Roam, which is a mode of free riding along the streets of the city. This is the main improvement of Need For Speed Underground 2 considering the previous version of the game where we couldn’t do it and were limited by race mode only. Now it’s all different and we can go anywhere we want, racing or free riding: we are the ones who have to decide. In this next image we can see an example of Free Roam game mode. There is a map where we can see other cars next to us, so if we want, we can challenge them and do an underground 1 to 1 race. If we win, we get 100$, if we lose – we lose money from our inside game account. Let’s keep with the options of the game: “options” menu we can configure the sound of the game, etc. This menu tab is the last one in the menu of the game. Now we can click on the “Sound” menu and adjust NFSU2 sound options. We can adjust almost any sound of the game. So, if we don’t like the music on the background or the sound of the engine, or any other thing, we can switch its sound off or make its volume lower. 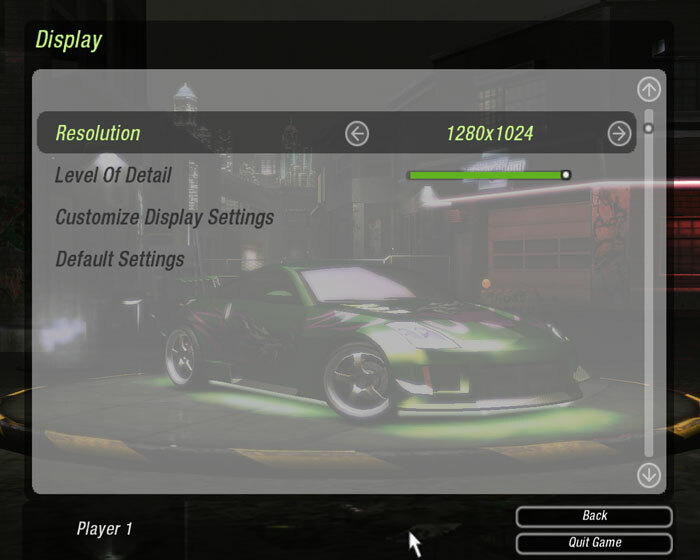 To achieve this great graphics quality of Need For Speed Underground 2 we need to choose maximum resolution value. To get to more settings we need to click on the third option that appeared on the previous image and we will see this window with many more settings that can be put at maximum. We can also customize other gameplay settings like its graphic interface, speed settings and the difficulty level of the game. In Player options there are more settings which also influence the game interface. Here we can also configure transmission and so on. To have everything set according to how we want the game to be, we can change the controls of the game. In this menu we can personalize absolutely any control we like. This next option is really great. If there is a song in the game that we don’t like especially, we can omit it or choose where we want to hear it. There is also a Quick Race mode included where we can choose to race inside a closed circuit, a race with predetermined number of laps or a skidding race. This is an example for Quick Race mode.